Tiny House Living: the Ultimate Un-Making Project? This post is different from those you’ve read before. It’s more personal, spiritual, revealing in a way. I hope you can relate. In many ways building a tiny house is the ultimate maker project. It involves geeky research, design and planning, often uses technology to help in the design process, and then becomes an epic DIY building adventure that results in seeing a dream come to life before your very eyes! There’s a lot of thinking, planning, doing, making & building. 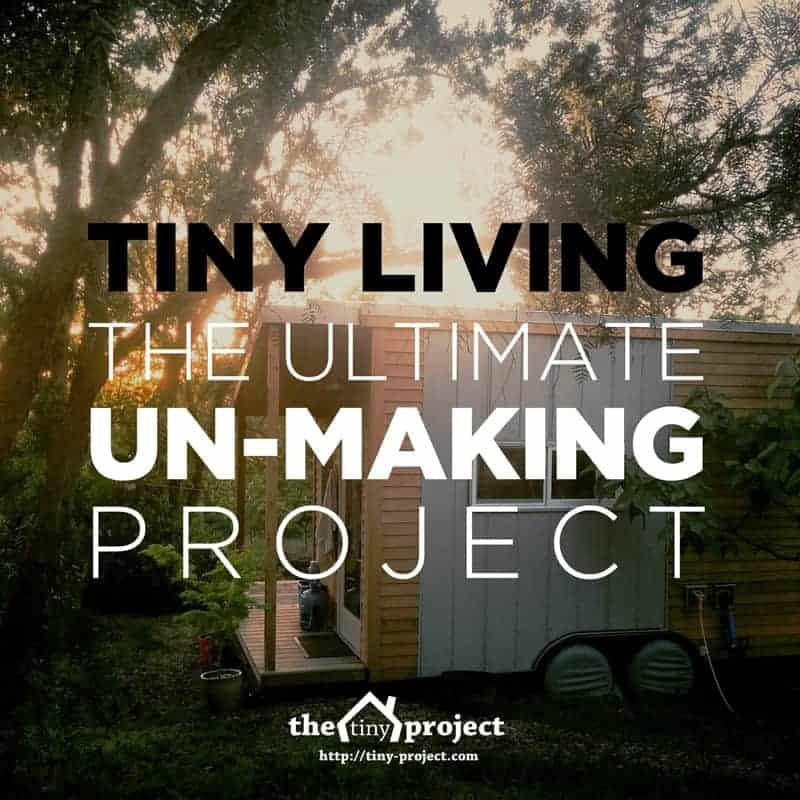 So why would I call tiny house living an un-making project? It’s about the intention behind all that doing. Why would one endeavor to design and build their own home? Why would one choose to forgo some of the conveniences of life, for a simpler, more conscious path? I can only speak for myself, but my deeper intentions are for un-making. Un-making the Western cultural myth of what success looks like. Un-making attachment to anything “outside” of oneself as a source of happiness. Un-making our limited beliefs about our own abilities to create/build/manifest. Un-making the unconscious patterns and routines we are stuck in. Un-making our feeling of separateness, loneliness, isolation. Un-making the bureaucratic structure that prevents common sense solutions needed for humanity to thrive. Un-making the constant drive for business, achievement, success. Even though there is so much “doing” that goes into the actual building of a tiny house, what about before and after the actual construction? It didn’t start with building — there must have been something deeper that sparked the desire to live the tiny life. I like the word Un-Making because it indicates a movement in the opposite direction — it’s a simplification, dismantling, and in this case also an inward process, not just an outward display of achievement. Now that my house is done, and now that I’ve been living in it for a year and a half, I find myself far more oriented towards the space that exits for undoing. That was the intention for the flurry of outward activity, mental overdrive, and physical super-human feat that I somehow accomplished in 2013. When I was in the middle of it, I’m not sure I knew that. It took some time to live with it and reflect to make conscious the deeper intention that was there all along, guiding all the mad research, planning, design, and building. So where does that leave me now? Isn’t this blogging right here just more doing, more making? Well, yes and no. What I hope is that through these words you too can find your deepest intention for going tiny…and then really LIVE that! Stick to that even when things get crazy and stressed out and seem impossible. If my continued involvement in the tiny house community can help people realize what tiny living is REALLY like, deep down, at the heart-point of inspiration, great love and intention, then that’s worth all the doing and much more. Can you connect with your un-making intention? Or is your intention for tiny living completely different? That’s fine too. I might be the crazy one. For others, maybe the doing itself is their joy and their medicine. I know that I get a ton of enjoyment and satisfaction from hands-on creative projects. It feeds me a in way hard to come by otherwise. But I also know there is far more to it than that. By living in my tiny house I intend to live simply and consciously; to un-make everything that doesn’t — or no longer — serves me. That sounds right. That sounds simple. Let’s see if that’s what tiny living can really be for me. This understanding orients my idea of the tiny life to one of doing without — not doing more or having it all. It’s NOT about how many creature comforts we can possibly pack into a structure on wheels that still fits into the the tiny house label. For me anyway, the smallness of the house means something far more than the simple goal of adhering to D.O.T. height and width limits. In future blog posts I’ll talk more about how this intention informs my ideas about what it means to live simply and consciously, human-sized, within one’s means, etc. I’ll also reflect on how this fits into the tiny house movement as a whole, and what I believe to be the “soul” of the movement both past and present. I’d love to hear some of the deeper intentions/goals behind your desire to go tiny. Please comment and let me know! ← Small is Beautiful: A Tiny House Documentary now available! I have been trying to articulate for years that tiny living is really a philosophy and not a building. I believe that you can “live tiny” without even living in a tiny house. I had no idea how much my life would change when I moved into the tiny house. Or, rather, how much I would change. The change that hit me hardest was how connected I feel now. I didn’t realize I was missing that connection before, but I really was. That is what I am most grateful for through the experience of building my tiny home. It is becoming quite obvious that the so called pro builders are driving up the price of tiny homes. Next thing you know they will be causing building codes so strict that no one can self build or afford one, just like they did to the regular houses. Yes Alek! Thanks for writing this down. And thanks for some “deeper” sharing. You need balls to show a more sensitive / conscious side. Balls and sensitivity… a contradiction? Nope. (I will now stop talking about balls). For me, building my own Tiny House is a wish for myself, from within. Simply because I wish to orchestrate my life the way it suits me. Without harming anyone. Out of love for myself. Out of love for many things. Not out of frustration or anger towards banks, society and systems. Out of love. And that’s my deeper meaning of my wish to live tiny. This is beautifully written and articulated. Your words definitely resonate with me deeply. I was obsessed with the making of a tiny house. It didn’t feel legit unless I had slaved over the thing myself! My husband and I finally decided we were kind of ready for instant tiny and moved into a 21ft. travel trailer (under 165 sqft). We have now been living tiny and loving it for more than two years and do not have any plans to stop. I still like the idea of building something with my hands. I feel like the building and learning process would be such a wonderful experience… But yes, you can definitely live the life without the building! For me, these thoughts came in a different order. I saw the ecsessive spending and buying and wasting, oh my the wasting. I saw the terrible cycle of how people are creatures of habit and that they will always do what they have always seen done. It started to seem like we as a society are pushed into consumerism as a distraction of what we are actually capable of accomplishing. I started to fear what our society was coming to, and was frustrated at how fast we were destroying ourselves. And then I came across tiny houses.. Which made me think, what a great solution. People are under the illusion that we’re always going to need something more and I believe it’s because they are looking in all the wrong places. I’ve always felt if you are happy with yourself the rest will come to you. This article was exactly the push I needed. There is something to be done about it, and the fact that people that have never spoken before can both see that is truly a sign that not all hope is lost. Although my thoughts are unorganized I am extremely happy to see that I’m not the only one who feels the need for ‘un-making’. I’ve been, on occasion to other countries and have seen, and was drawn to experiencing other cultures, lifestyles, etc…. After seeing how people in other parts of the world live, and knowing how some people live in the US, I don’t feel a need to have more space in order to live. I don’t need much. warmth, a place to prepare food, a place to sleep, a place to go to the bathroom, and to clean up. The money that I make at my job is what I’d like to use to do the things I like to do… not take care of a large structure. A large structure has never been a goal of mine. It DID just sort of happen because for too many years I worked to get more….. more money, more things,,,, silly really. I’ve reached the point in my life where my kids will be moving out, and as I grow older I want to travel more. I visit older relatives homes and I see 3000 square feet of junk. Things they have never used in years. Piles of clothes that no one has worn in years. I find it very uncomfortable to be around all of their junk. I want to have less so when I come home it feels comforting, and when I die no one has to dig out my house! I chose to lose everything in 2012 at age 39 when I was 6 months pregnant due to being in an abusive relationship……I lost everything except my wee man that I was carrying. He was/is the most important presence in my life, had I chose to cling onto my lifetimes worth of material possessions, top notch credit and business it would most likely have meant that I would have lost him. Leaving with my big pregnant belly and a suitcase was the best decision I have ever made. Its been three years since that decision was made and my whole life has changed for the better. Not everyone reaches a point in life when it dawns on them what is truly important…….things don’t make one happy……life should make oneself happy. My tiny house build has just begun and I already know that I will appreciate every aspect, and every detail of its abundance. I’ve always called it my definition of success. Thank you Alek for sharing those thoughts about intention etc. de-cluttering and organizing the things you actually need to live seems to bring peace of mind and pleasure in enjoying the present moments of your life rather than time spent regretting past mistakes or worrying about the future or being “mind-controlled”by media propaganda “News”or advertising of consumer goods.cars,shoes,jewelry,fancy cookware “slimming”clothes,latest “fad diet”or junk food or newest “tech toy”to distract or divide humanity instead of inspiring each other to play a part in making their “light shine”in their own heart then the neighborhood,town and world .Listening to “positive”messages & music which resonates with the Universal tones or frequencies or vibrations which evoke happy,healthy emotional responses ,love & compassion not “Fear” or Anger or resentment about perceived “injustices” but being the “change”you’d like to see in this world ..look inward and live from a Heart-centered not Ego-centered choice ..the “golden Rule”do unto others as you would have them do unto you ..service to others in need .but nurturing your own soul and showing “love”& respect for all you encounter.Natural Law like “truth”is eternal,not subject to “evolving”beliefs. the Divine Source of Creation intended “humans”to live in harmony as equals in the power of our Souls within to create a thriving ,nourishing ,joyful and unpolluted environment to manifest in our Reality..not be slaves to “Group Think”or Dogmatic Religions or Institutions which seek to “control”our every action ! Blessings to you !